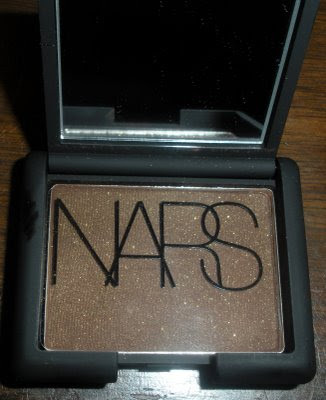 I love love love love love NARS. 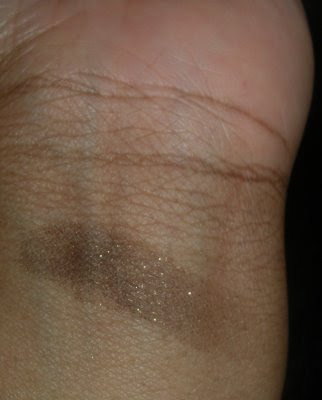 And I love that eyeshadow. I have a similar one from Too Faced. MAC's Warrior collection looks hot but I don't think I want/need anything. As far as the recession...it has hit me. State workers have taken a budget decrease so I most certainly think twice before spending every dollar. If I have money to spare, I think about saving it. "It" is indeed a character, but not worthy of a show. And I think Prancer will win the show, Myamee is to pritzy and Saphayrie is too "special" and those three want Tailor Made and It out, so neither of the men will win. "It" is very, very special! It has to be an act. I haven't really given up anything despite the recession because I've always been very frugal and saved a lot. I guess if it came down to it, I would refuse to give up my cable. I hate Hubbys movies and he hates mine. It would be a warzone up in our house. My wedding cake was free :) And it was beautiful! Recession: I cannot give up my hair products. Not unless I want to walk around looking a hot mess. Bride to Be: How about pulling some inexpensive looks for we wedding goers. I have two wedding coming up this July and I have no idea what to wear. VH1 I love Money: I love that show (yes I just admitted that out loud) but I have no idea who you meant when you said "is he just playing it up for the cameras." Do you mean Tailormade? I haven't watched the show in a while. B it sounds like you're being really smart with your money! Laughing you are right prancer is a pretty tough cookie but when it cones down to it I think Miyamme may be able to put up a fight. It should be ashamed of himself. TM a free wedding cake that's a great gift. Emeritus great idea, I will pull some looks that guests can wear to weddings. Ok on I love money there is a black guy and they call him IT, I don't know what his real name is but he acts like a dummy. I think it's all an act, he even mentions that they "think" he's dumb. Tailormade has actually been a good guy on the show. He hasn't been lying and he supports his pals. He's done pretty well fir himself. Recession has hit me hard but my hair is 75% gray so I will never ever give up my monthly salon visits to get my hair dyed nor will I give up my lip waxing! Everything else I always find a way around it or do it myself. Just Me you keep saving, i know you will reach your financial goals. Tami you seem to be quite the resourceful lady so salon visits here and there sound great!